First make sure that you have created a data source to access the tables in the Mortgage database in the above folder, then create a form called frmMortgageTypes. 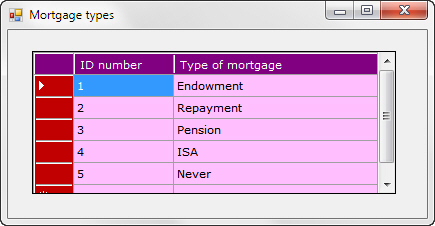 Add a DataGridView to your form to show mortgage type records from the MortgageType table, and format it to look interesting! Remember to unset the form's EnableHeadersVisualStyle property to get the row and column header formats to display. Set the AutoSizeMode property of the right-most column to make it fill the space at the right of the DataGridView . When you're happy with how your DataGridView looks, close down the form.